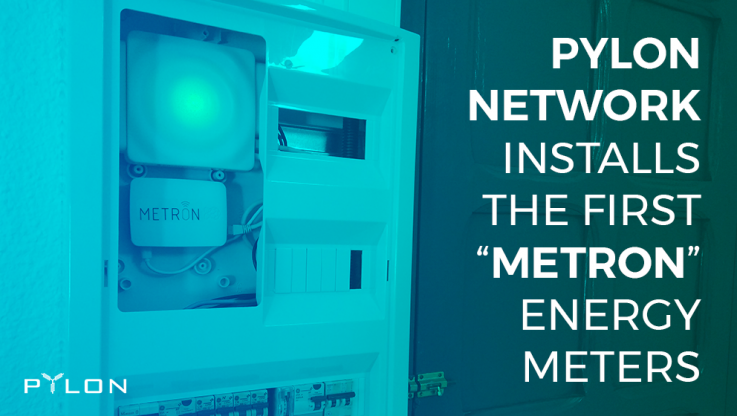 Pylon Network installs the first “Metron” energy meters at users of the GoiEner energy cooperative and begins to test its blockchain platform in a real environment. Pylon Network, the open-source P2P blockchain trading platform designed to trace and pay for energy exchanges between users participating in this decentralized network, begins the installation of its smart metering devices called “Metron”, which will acquire energy consumption data in real time. The first participants in the simulation of the platform are members of the GoiEner Basque Country energy cooperative. It is the first step towards expanding the project among a larger group of voluntary Goiener participants in the next stage of the installations. The project developer team (Klenergy), formed by a group of young entrepreneurs and backed by the experience of expert collaborators in energy markets, renewable cooperatives and hardware-software developers, have been working on the platform called Pylon Network for a year. It is a “market-place” of renewable energy where, thanks to a hardware device called Metron and the software (blockchain) it integrates, users who belong to this platform (at this time GoiEner partners) can buy and sell energy using the Pyloncoin payment method, manage the periodicity of their payments and even have the certainty to who they buy or sell their energy. To do that, they use a technology called Blockchain that allows them to have a decentralized, transparent and immutable data layer, where they can trace and have total certainty of the operations / exchanges that take place within a network, in this case , the energy market (see Figure 1). Figure 1: Pylon Netowrk’s data layer structure – adopted to the energy market structure. At the end of January they took a strategic and innovative step towards the development of the project, publishing the central code – the “CORE” – of Pylon Network with an open source license (Open-Source) – the first fully-functioning blockchain code developed specifically for the needs of the energy sector (see more here) and also gave access to its DEMO platform (see more here). Last week, from March 5 to 9, 2018, the Pylon Network team traveled to the Basque Country in order to carry out the first installations of the “Metron” smart metering devices at GoiEner’s members. It is an energy monitor that connected to the electrical box of your home and having internet connection, accounts and certifies all energy flows that pass through it, and also integrates the PylonCoin payment method. During the testing phase (end 2018), the installation of Metrons will continue, acquiring more and more real-time data from GoiEner members who want to participate in the simulation, for which an express-of-interest form will be opened by the cooperative. It is intended to have a representative sample of users “testers” who, combined with the knowledge and experience of GoieEner from the energy market will serve to validate all the hypotheses that arise in this disruptive energy exchange system, helping, on the one hand to reduce the energy consumption of the users and on the other hand to optimize the operation of the cooperative itself. PYLNT to be listed on Les Covex exchange!